For thousands of years, belief has been an integral part of human societies, and has taken many forms – prayer, ritual, pilgrimage. 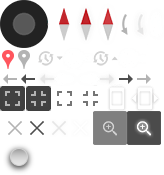 Here are some key objects you will find in the show. Most accounts in over 4,000 faiths surviving or recorded worldwide acknowledge the importance of light and water to life. Darkness allows human fears and sorrows full rein whereas the certainty that the sun will always rise in the morning offers hope. Equating light with life, goodness and/or a deity is a worldwide phenomenon. In the Bible, God commands that there should be light to drive away the darkness (Genesis 1:3) and Christ is equated with the morning star with the promise of life and everlasting day (Revelation, 22:16). Similarly, the Qur’an (24:353) epitomises Allah as the light of the heavens and likens this light to a glass lamp in a niche. 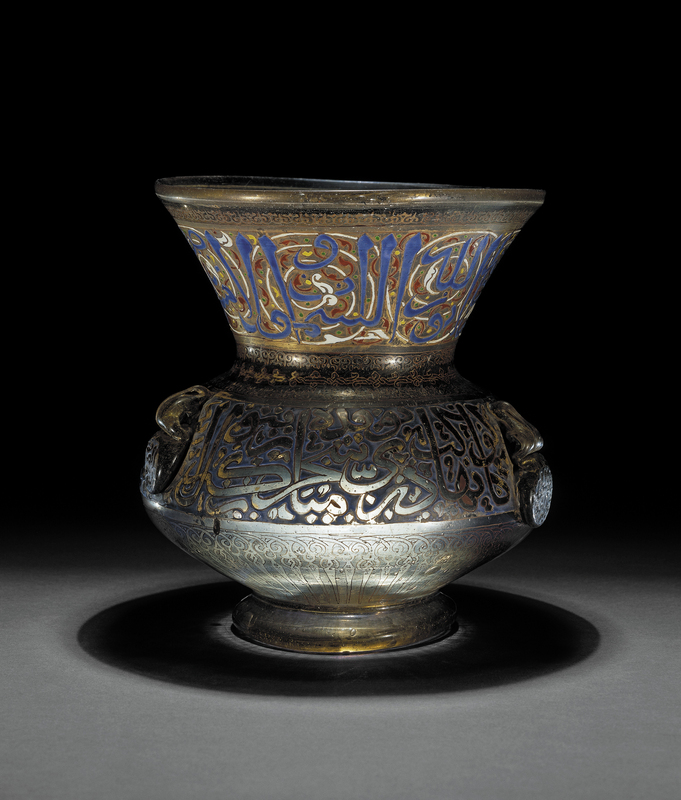 This verse is inscribed in the calligraphy on this enamelled and gilded glass lamp from Aleppo. It also states that it was made for the mausoleum al-Salhibiyya al-Taqiyya, perhaps for the vizier Taqi al-Din who died in AD 1316. Inner goodness is often equated as light and epitomised by fire. In Zoroastrianism, a religion that began in ancient Iran but is now centred around Mumbai in India, fire is the visual symbol of purity, an enlightened mind and a god who cannot be seen. No rituals can take place without fire. 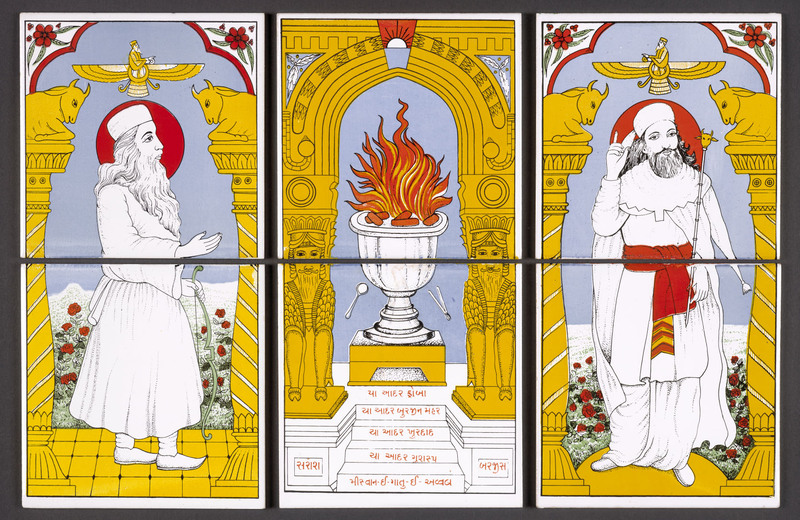 In these glazed ceramic tiles from a Parsi home shrine in Gujarat, the mighty, guiding fire of thought is shown at the centre so that prayers can be directed to it. The left and right panels depict the prophet Zarathustra, and Lohrasp, the legendary king of an ancient Iranian epic. Above their heads are the winged symbols of Faravahar, emblematic of the spirit of a human that exist before birth and again after death. Spirits that persist after life are also a concern among the Yoruba-speaking peoples of West Africa. The Yoruba have a birth rate for twins that is four times higher than anywhere else in the world. They are believed to have special powers and bring luck, health and contentment to the family. Their birth is celebrated with immense joy but the death of one or both may bring dangers, as well as sorrow. To prevent bad fortune for the family and wider community, the parents commission the making of wooden ibeji that they take care of as a living person. Humans think about death with trepidation and sorrow as the one certainty of their lives. 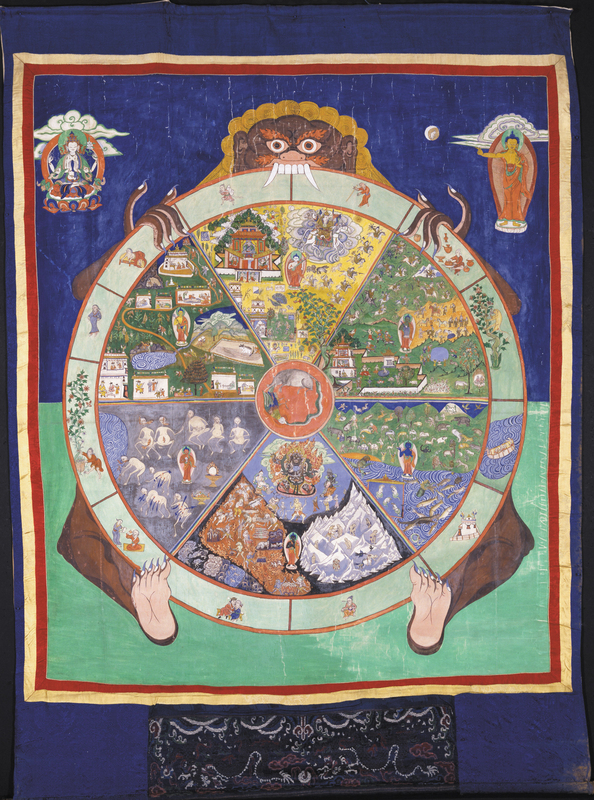 This 19th-century Tibetan Buddhist thangka depicts the wheel of life. A thangka is used for teaching or as a devotional object, and this one shows the world in the arms of the demon Mara, indicative of temptation, death and impermanence. His limbs symbolise the sufferings of birth, sickness, old age and death. The six segments show the higher realms of existence in the three segments at the top. The lower segments depict the sufferings of animals, ghosts and hell. The outer circle symbolises how our actions influence future lifetimes. Above the wheel on the right is Buddha showing the path to liberation by pointing to the moon and on the left a bodhisattva, a person capable of reaching nirvana but who does not do so out of compassion for others. In Buddhism, a better life and karma are achieved by giving up material things, meditating and being compassionate. Following in the footsteps of Buddha on a pilgrimage also helps. In Asia it is not only Buddhists who become pilgrims. Millions of Hindus trek up mountains, walk to the source of Ganges or visit the places where saints and teachers lived. For Muslims the pilgrimage to Mecca for hajj is an obligatory religious duty and one of the pillars of Islam. Pilgrimage is also important in Christianity. 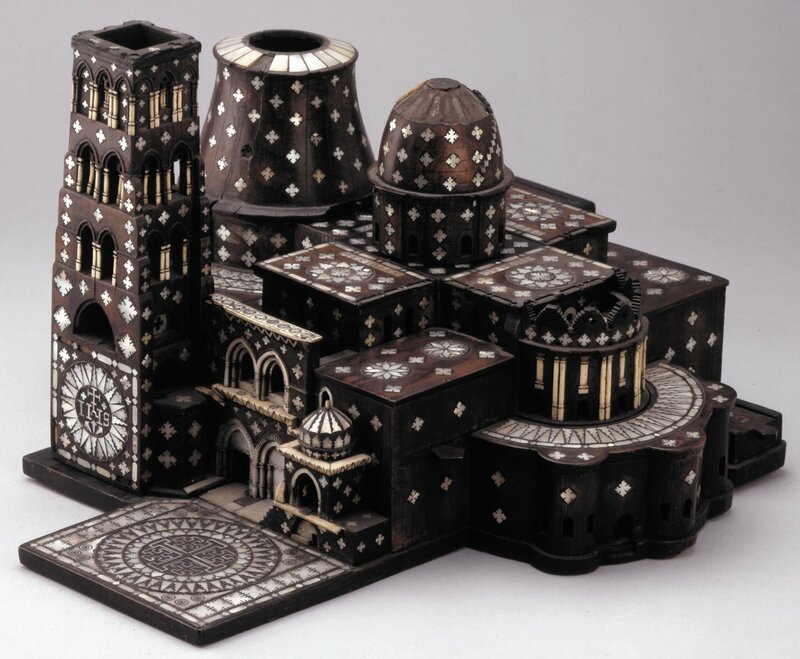 Souvenir models of the Church of the Holy Sepulchre in Jerusalem and the Church of the Nativity in Bethlehem were made under the supervision of Franciscan monks working from drawings made by Bernadino Amico a, 16th-century monk and architect. An example of the former was collected by the Museum’s founder, Sir Hans Sloane. Its roof can be lifted off to reveal the layout inside the church and the location of Christ’s tomb. ‘Natural religion’ is practised by traditional societies in many parts of the world. In south-west China, the Miao people get dressed up for an outdoor festival to reinforce spiritual links with ancestors of the community, strengthen bonds among the living and ensure good fortune. 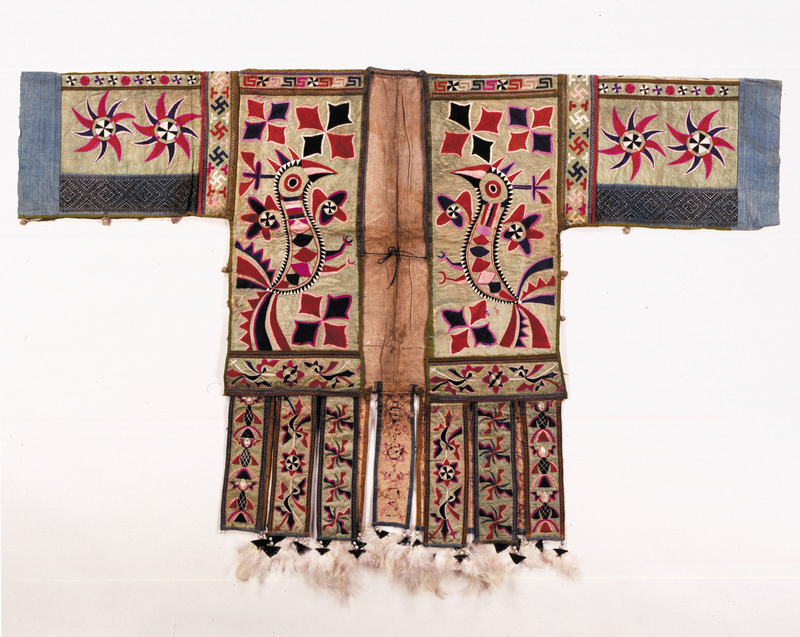 This ‘Hundred Bird’ coat is made from hand-spun cotton woven and embroidered all over with birds, insects and geometric patterns. The birds are often seen as avatars linking the spiritual realms of the cosmos as they walk on land and fly into the sky. In south India festivals are often celebrated by pulling the image of a deity on a juggernaut from a temple to allow vast crowds to have auspicious sightings of one or more of India’s 330 million deities. 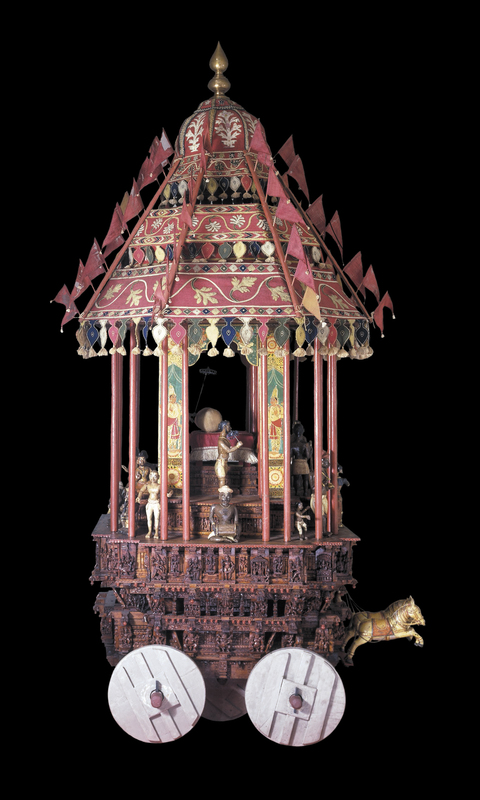 This scaled down replica of one of these processional chariots was acquired by the British Museum in 1793. It did much to inform the public about the complex of numerous highly varied religious paths that were lumped together under the invented name ‘Hinduism’, which derived from the name of the people living in the Indus River region, for the purposes of census taking under colonial rule. The pursuit of the mystical provides individual and social identities that are emotionally sustaining but sometimes politically dangerous. 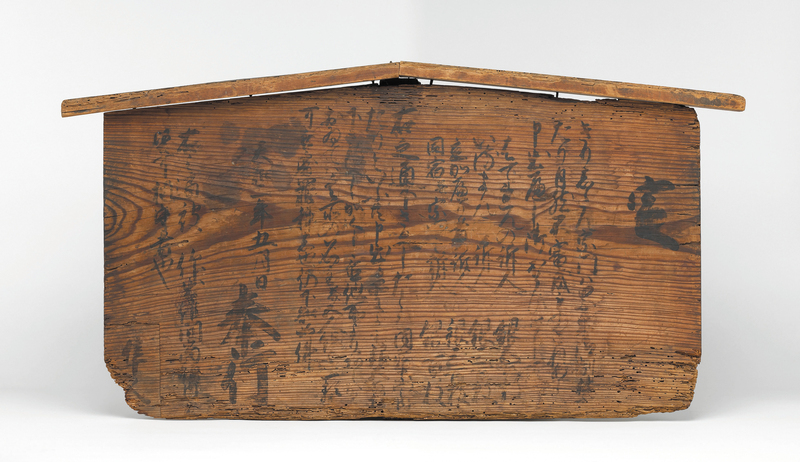 This Japanese notice board from 1682 offers rewards for information against Christians. It reveals how authorities in Japan turned against Christianity, having initially allowed conversions by Jesuit missionaries. This persecution was encouraged by the view that the new foreign faith undermined traditional Japanese values and the sovereignty of the state. The exhibition Living with gods: peoples, places and worlds beyond is on from 2 November 2017 to 8 April 2018. The accompanying BBC Radio 4 series will be broadcast from 23 October 2017.